At Bridgeman Land & Livestock we stand nine American Quarter Horse breeding stallions. Disposition, personality, and trainability are all qualities that we breed for. Our horses are easy to train and go on to have many different careers. They can be used for simple trail riding horses or can go on to be top show or rodeo horses. Quality is our main focus. They must be conformationally correct as well as having a sound mind. Horses from our program have gone on to be AQHA point earners, futurity winners, and great youth horses. 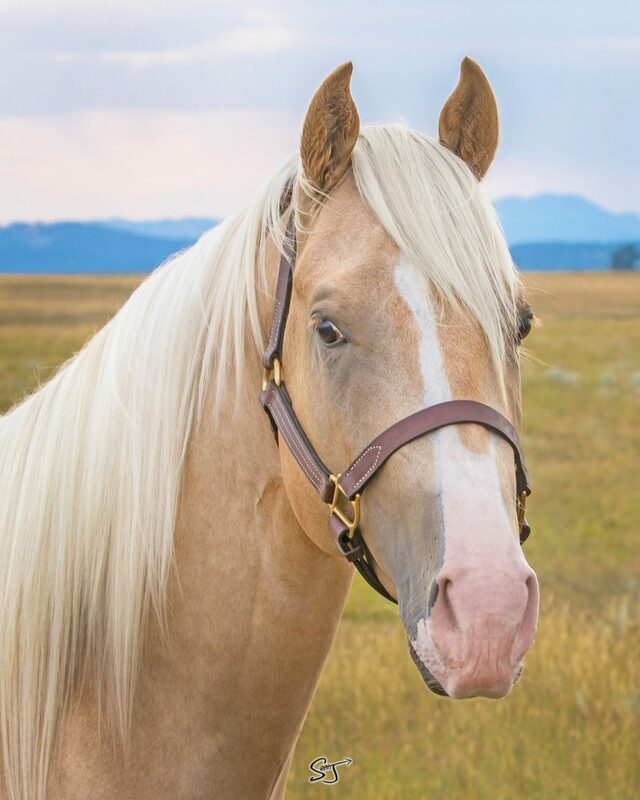 Silky TA Fame a 2015 palomino stallion was purchased in October 2017 and his first foals are expected in spring 2019. By Dash TA Fame who is the number 1 leading barrel horse sire. 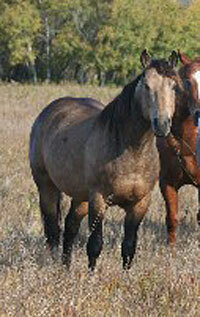 Out of Silky French Pie by Frenchmans Guy who is the number 2 Leading barrel horse sire. Silky french pie was the 2006 leading 5yr old futurity horse with earnings over $40,000.00. Gage is very athletic with a super disposition. Kristy and Tyler look forward to riding him this summer and starting him on the barrels and some steers. Brays Eye Full was introduced in 2013 from Oklahoma. He is a son of Mr Eye Opener who has a SI of 106 and has sired multiple race and barrel racing winners. "Dillon's" dam is a daughter of First Down Kelly that has a SI of 93. "Dillon" was never raced due to an injury as a yearling. Dillon's foals are proving to be very trainable and athletic. He sired the 2015 NDNBHA 1D Champion "Bullys First Bug". She is also an NDRA and RRA Ladies barrel racing finals qualifier in 2017. Foals are eligible for the CBHI and Western Fortunes incentives. SDP Snow Man was introduced into our program in 2015. He is a son of TR Dual Rey out of RW Snow Kitty who is a daughter of High Brow Cat out of a daughter of Docs Stylish Oak. "Snow Man" was lightly shown in the cutting pen before we purchased him. His first foals hit the ground in 2016 and are looking great. We look forward to starting some in 2018. He is being crossed on some of our HA Chairman Prophets daughters as well as some of our running bred mares. With bloodlines of Two Eyed Jack and Leo "Blue" has sired a few rope horses already for his previous owner. We are looking forward to crossing him with some of our Boggies Flashy Dell and MRH Fancy Money daughters to produce some head horses. Lenas Wild Cat adds the foundation bloodlines into our program. He is registered with the National Foundation Quarter Horse Association as well as the AQHA. The NFQHA recognizes horses that have ancestors that were the founding sires of the Quarter Horse breed. With this they are trying to bring back the traditional style Quarter Horse also. 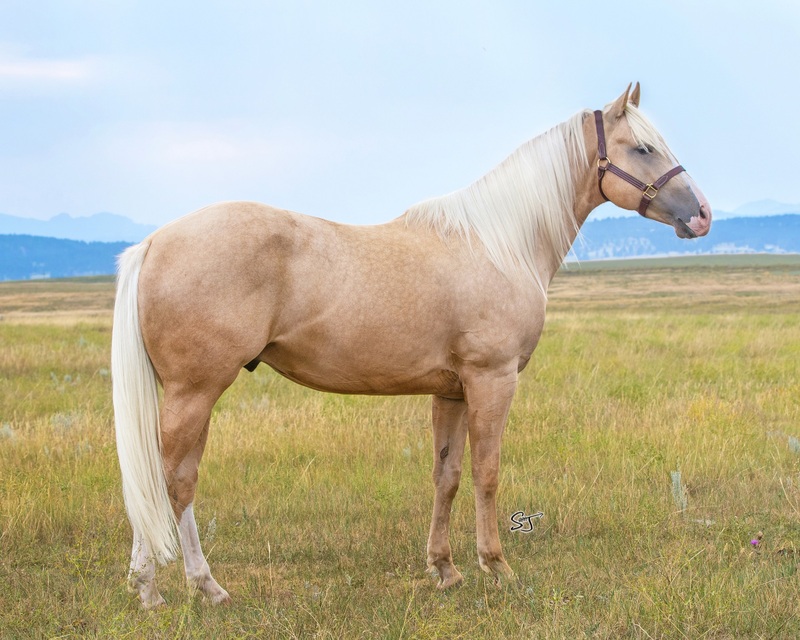 He is an 87% foundation buckskin stallion with bloodlines of Doc O'Lena and Peppy San. He sires very gentle, easy going foals that always come up to you in the pasture and really love people. HA Chairmans Prophet is a 2005 Chestnut stallion by IM Chairman out of Peppy Rey Jean an own daughter of Peppy San Badger. His foals are great looking and very trainable. His foals are very cowy and proving to be great rope horses. Dancin Doc Doll from his first foal crop is a saddle winner and multiple jackpot & rodeo money winner as a heel horse. Leo Drift Ash a 1998 AQHA Buckskin stallion by Ciderwood. Double bred Driftwood. Ciderwood is a 3/4 brother to Wilywood. Horses with these bloodlines have proven themselves as team roping horses, barrel horses, tie down horses and great using type ranch horses. Mitos Apache Ghost a 2012 Perlino stallion by Mitos Perfection. Ghost produced his first foal crop in 2017. They were a colorful bunch with very correct conformation and great dispositions. Mitos Mister Sonny a 2012 bay stallion by Mitos Perfection out of KSC Bugs Alive on of our programs greatest broodmares. Sonny produced his first foal crop in 2017. Pretty heads and long legs arrived. Mitos Perfection Mito was our main stallion since 1995. He was a buckskin son of Mito Cody that sired easy going, trainable foals. Mitos foals have been very well regarded by anyone who has ever owned one for their personality and gentle way of doing things. He has sired AQHA point earners as well as many futurity winners as well as ranch horse competition winners and rope horses. We have a number of his daughter in our broodmare band who are crossing very well on our other stallions! MRH Fancy Money a 1999 AQHA Red Dun stallion by On The Money Red. On The Money Red was the 2002 leading sire of barrel horses and continued to stay on the top 10 leading sire list long past his death. "Boomer's" dam goes back to Easy Jet, Triple Chick, Flit Bar and King. Boomer was a 1D/rodeo money earner himself until Kristy retired him from the arena. Sire of multiple 1D horses that can drag calves in the branding pen or head a steer too. Moneys Superman is a Pro Rodeo winner & money earner in Canada & the US as well as a multiple large jackpot 1D winner. Money At Par was the 2014 NAERIC Barrels of Cash futurity champion. Boggies Flashy Dell was a buckskin stallion by Boggies Flashy Jac who's offsprings earnings exceed $400,000 in reining earnings. "Flashy" himself was shown in reining and is an AQHA point earner in that event. His foals are trainable and extremely athletic. Many have great cow sense and are being used in a variety of events excelling in team roping and barrel raching.